Red garlic chutney recipe – It has spicy and strong garlic flavor. It is made with dried red chilies and garlic. 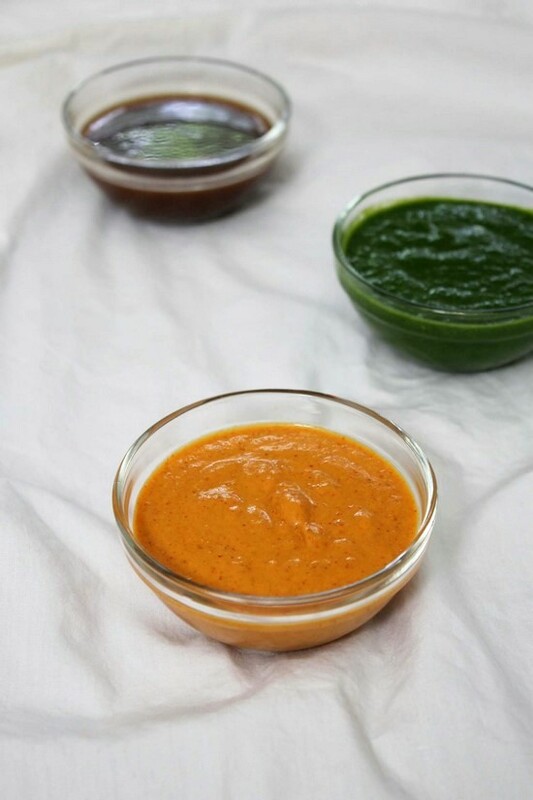 This spicy red chutney is kind of must while making chaat recipes. It makes the chaat dish hot, spicy and flavorful. Apart from this red chutney other two chutney are also must for chaat recipes. Those two chutneys are green coriander chutney and tamarind-date meethi chutney. Making this chutney is very easy. 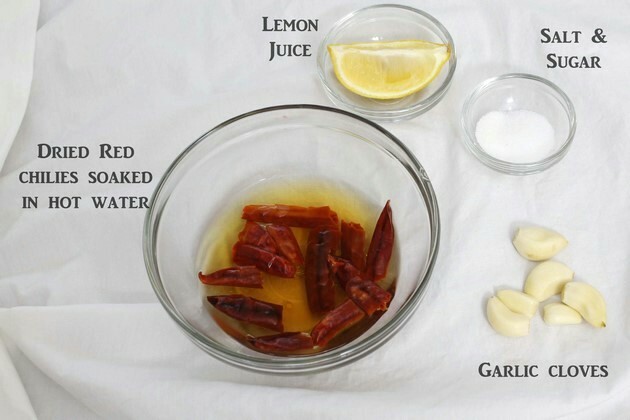 It required very less and basic ingredients like dried chilies, garlic, salt, sugar and lemon juice. You cannot handle that much spicy flavor. Here are some tips to control the spice level. Seeds makes the chutney extra spicy. So always remove the seeds of chilies. Or simply thin out the chutney with extra water after grinding. It helps to make it slightly mild. 1) Remove the stem of the dried chilies. Break the chilies into half and remove the seeds. My MIL says – stems and seeds of chili are not good for health. 2) Soak in the hot water for at least 30 minutes. Make sure that you use hot water. I microwaved it to make it hot. You can do on stove top as well. The color of the water will change as time goes. 3) Take chillies with water, salt, sugar, garlic cloves and lemon juice in the blender or grinder. 4) Grind it till you get smooth paste. Remove it to a bowl or store in container. Keep in the refrigerator. Always use clean spoon to remove the needed quantity. Other than using in chaat recipes, this chutney can be served as a side along with your meal just like pickles. It can be served as an accompaniment with mild dishes like idli, dosa, vada, momos. For a change, spread it very lightly on the bread while making sandwiches. Remove the stem of the dried chilies. Break the chilies into half and remove the seeds. Soak in the hot water for at least 30 minutes. Take chillies with water, salt, sugar, garlic cloves and lemon juice in the blender or grinder. Grind it till you get smooth paste. Remove it to a bowl or store in container.